Roseanne’s return to television is getting promoted in an unlikely place: through the naming rights of Saturday’s NASCAR Xfinity Series race in Fontana, California, reports Business Insider. Yes. You read that right: Roseanne. Welcome to the National Association for Stock Car Auto Roseanne. Fox, of course, is the broadcaster for NASCAR’s second-tier Xfinity Series this time of year, so they’re in the bizarre position of promoting the Roseanne reboot by proxy, which airs on rival network ABC. Michael Fishman, who plays DJ on the show, will be the Grand Marshal for the race. My coworkers couldn’t quit laughing at this, but a TV show-named race is somewhat on-brand for NASCAR. This is the series that gave us such gems as the Teenage Mutant Ninja Turtles 400 and the SpongeBob SquarePants 400 through a partnership with Nickelodeon. Kids’ shows seem like a no-brainer, though. If your kid’s into series like Cars, why not take them to see the real cars? You’ll all probably have a blast. Our anthem is hard to sing, but this was intentionally terribad. 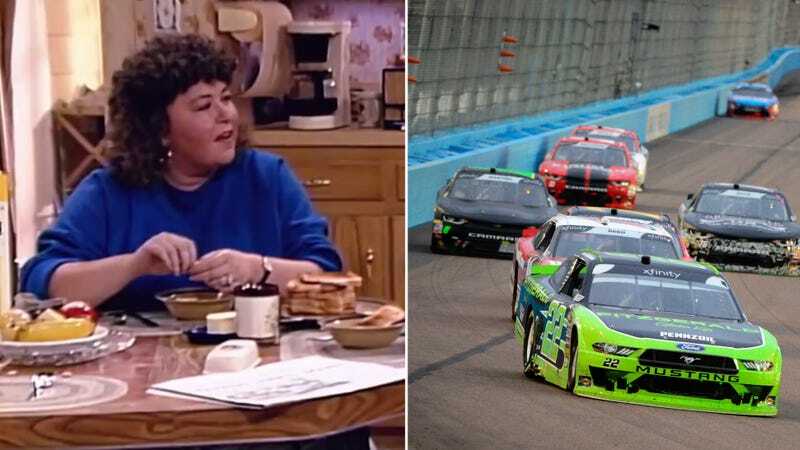 Now we’ve got Roseanne’s eponymous show sponsoring a race in the series that takes the national anthem perhaps a bit too seriously, with NASCAR team owner and legendary driver Richard Petty threatening to fire any drivers who didn’t stand for said anthem. If NASCAR lets Barr do the anthem at this race, it all starts to make sense. I’ve got it! The lines on my crazy conspiracy wall (you know the kind) all come together in one, focused point. NASCAR thrives on making certain personalities out to be the heel, and this season has been just a bit too polite. Roseanne is the perfect heel. I anxiously await a good ol’ fashioned pit lane fight between Roseanne Barr and Richard Petty.